The Favorites is a series briefly exploring films I love, to find out what makes them - and me - tick. The Godfather Part II (1974/USA/dir. Francis Ford Coppola) appeared at #9 on my original list. What it is • Several years have passed since the events of The Godfather (depending on your source, as few as three or as many as seven). Michael Corleone (Al Pacino) has moved the family business out west, and the effect is slightly chilling. 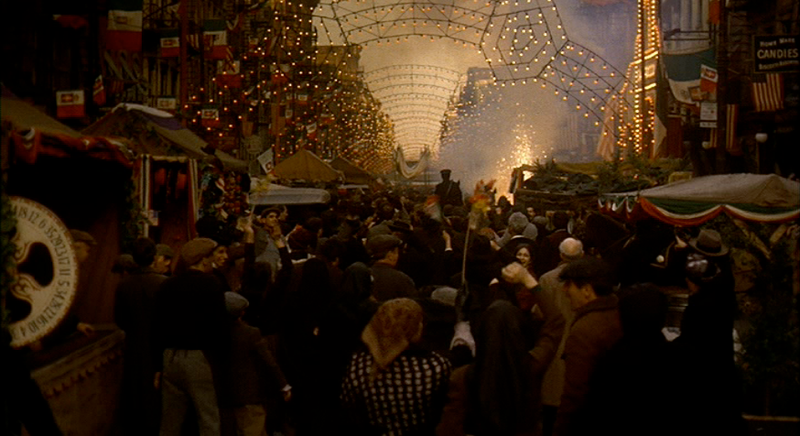 In the original film, the Mafia already operated on a grandiose political level detached from its reputation for sleazy street crime. Now Michael is fully enmeshed with the political and corporate world of postwar America, and his geographical relocation exacerbates his distance from the old world (as does his visit to Cuba, sitting side by side with the heads of "legitimate" financial powerhouses, further blurring the lines between the Mafia and Big Business). Yet even as we watch the mobsters advance into modernity, we leap back in time to explore their roots: the film actually begins in Sicily, with a young Vito Corleone (Oreste Baldini). As in late fifties America, turn-of-the-century Sicily makes no real distinction between the wealth and power of criminals and politicians: when local kingpin Don Francesco (Giuseppe Sillato) condemns Vito to death for his father's betrayal, there is no greater authority to condemn him, and Vito must flee for his life. In New York of a hundred years ago (where the boy grows up to be portrayed by Robert De Niro), crime is the only available path for the underdog immigrant, the only way he knows he can protect his family. The irony, of course, is that in the present day Michael follows the path his father set forth and it leads not to the preservation, but to the destruction, of his family. Michael's wife Kay (Diane Keaton) is estranged, his son Anthony (James Gounaris) is threatened, and his brother Fredo (John Cazale)...well, poor Fredo. The Godfather Part II portrays the chilling logic of power, its ability to destroy even that which it has been unleashed to protect. If The Godfather suggests a graceful acceptance of this reasoning, Part II bravely follows it through to its bitter end. There aren't many sequels among my Favorites - even when obvious opportunities present themselves (like one of the later Star Wars films) I have a tendency to favor the original over the works following in its footsteps. Unsurprisingly, The Godfather Part II is the film to buck this trend. It's the only sequel to win Best Picture or to place on many Greatest-of-All-Time lists, and amazingly it does so not as an improvement on a first chapter that didn't really have its act together but rather as the extension of one of the most popular, beloved, and acclaimed classics of all time. On my own list, The Godfather appeared in the top twenty, yet here Part II is even higher. And I'm certainly not alone in that preference, no matter how slight, over its iconic predecessor. I think above all I'm drawn to The Godfather Part II because of its family portrait. There is a heartbreaking truth in its portrayal of love and loyalty to family as immensely self-destructive. This is not to ignore the film's searing, if implicit, critique of capitalism, imperialism, and representative government - an area in which it capitalizes on the first film's casual cynicism and then extends those observations to their breaking point. But at heart this Godfather is psychological more than sociological, and it locates Michael's fall within his own personality, no matter how complicit the society surrounding him. I find Michael endlessly fascinating. He is a ruthlessly cold fish, able to control the expression of his emotion, willing to allow calculation to override every other consideration. But "control" is the key word - there is a seething passion beneath his icy demeanor and this is true of the film as well. Even more than its antecedent, Part II embraces a stately classicism while allowing a furious engagement with the characters' inner lives to animate the restrained mise en scene. This is never truer than the sequence following the death of Mama Corleone (Morgana King). Michael sits alone in the boat room, the darkness crowding in on him with a thousand evil whispers. His sister Connie (Talia Shire), a mousy housewife in the first film turned playgirl sophisticate in the second, bends her knee before him, begging forgiveness for a brother's betrayal, pleading for him to come in from the cold. He does. He embraces Fredo. And he looks at Al Neri (Richard Bright) with a gaze so piercing that Neri looks away with sinking comprehension. If there's a better portrait of rage sublimated into something far more dangerous, I don't know it. This is one of the great scenes in cinema; to reference David Lynch, this is the "eye of the duck" for the entire Godfather saga. The Godfather Part II echoes Cain and Abel, but with a twist: the man who refuses to be his brother's keeper is not the malcontent ne'er-do-well jealous of his sibling's accomplishment, but the successful one, contemptuous of the other's weakness. That, Coppola's masterpiece tells us, is the way of the world. More from me • You can watch that powerful scene in "Pray For Us Sinners", a chapter of my video clip series "32 Days of Movies" (the relevant clip opens the entry). I wrote about both Godfather films side by side for my "Big Ones" series, and included images from the "flashback" pieces of the film in my visual tribute to Michael Corleone's fall from grace. How you can see it • The Godfather Part II is available for blu-ray/DVD rental on Netflix and digital rental/purchase on YouTube, Amazon, iTunes, Google Play, and other sites. What do you think? • What other sequels (or prequels, which The Godfather Part II is as well) add as much to their sagas as this one does? Do you prefer the Pacino or De Niro sections of the film (I love both, but it's definitely the Michael Corleone stuff that earns this film its place in my top ten)? Do you think the much-maligned The Godfather Part III is redundant, or does it add something new and important to the story (I think it does, whatever its flaws)?